Can you identify this bowler ? - Tamilians now know him better. .. If you know somebody reeling out statistics of the game and is above 40 at least and you feel like stumping him with a Q – just ask him what the format of Ranji trophy presently is >>>> ………… if you yourself are a novice, read on : Ranji Trophy is the premier domestic tournament of the Nation, played between States (there are Cities too – Hyderabad, Bombay – UT Delhi; others Railways and Services also….) the competition is named after England and Sussex cricketer Kumar Shri Ranjitsinhji (Jam Sahib of Nawanagar, also known as "Ranji"). The 2013 Ranji Trophy was won by Mumbai, who won their 40th title by defeating Saurashtra by an innings and 125 runs on 28 January 2013. When we followed the game faithfully, it was Zonal format, Tamilnadu would play hard against Karnataka, Hyderabad was also a tough team ~ Andhra was easy and Kerala was the weak link…. Then Goa also came to the fold of South Zone - this zonal format continued for decades………. Then in 2002-03, it was Elite and Plate league. Six teams from Elite and two from Plate made it to the quarter-finals. Now there are 3 groups of 9 teams each – each team thus gets to play 8 matches - 3 from A & B and 2 from C make it to the quarter finals.. The new format has brought in parity in the number of matches that the teams play against each other in the league stage. 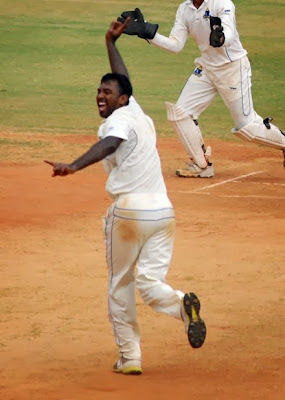 Earlier, in the Plate Division, a side could play five matches at the preliminary level. It was Offspinner Saurasish Lahiri's seven-wicket haul that set up a thrilling four-run victory for Bengal against Tamil Nadu, helping the team all but qualify for the knockout phase. Chasing 185, TN were comfortably placed at 102 for 1……… but morning was different – Badrinath was out – Dinesh Karthick played a good innings of 62 - in the twelve-over period between the 61st and 73rd overs, as TN lost six wickets for 27 runs to slide from 131 for 3 to 158 for 9. The last wicket pair took them too close but still the win was Bengal’s. So, Tamilnadu is out of contention…. Elsewhere there was the match between Jammu & Kashmir and Tripura which otherwise would have withered into wilderness….but for the fact that J&K qualified with this draw and squeaked past Goa by 0.001…. Prior to the 2013-14 season, the farthest Jammu & Kashmir had progressed in the Ranji Trophy was the pre-quarterfinal against Odisha in 2000-01. On Thursday, they qualified for the Ranji Trophy quarterfinal by the thinnest of margins - their quotient was 0.001 better than Goa's - after drawing their game with Tripura in Agartala. After Goa's victory over Andhra yesterday, they were tied with J&K on four wins from eight games. J&K, having already secured three points from the first-innings lead, needed to beat Tripura on the last day or ensure they kept their score in the second innings above Goa's quotient to ensure qualification. Chasing 228, J&K finished at 87 for 2, staying ahead of Goa's quotient. J&K finished with a quotient of 1.006, over Goa's 1.005. J&K will now play Punjab in the quarterfinal at Moti Bagh in Baroda from January 8. Tough …. Very interesting indeed.